This is a 200 km route (five days of cycling and a last, free day) across much of Cyprus. 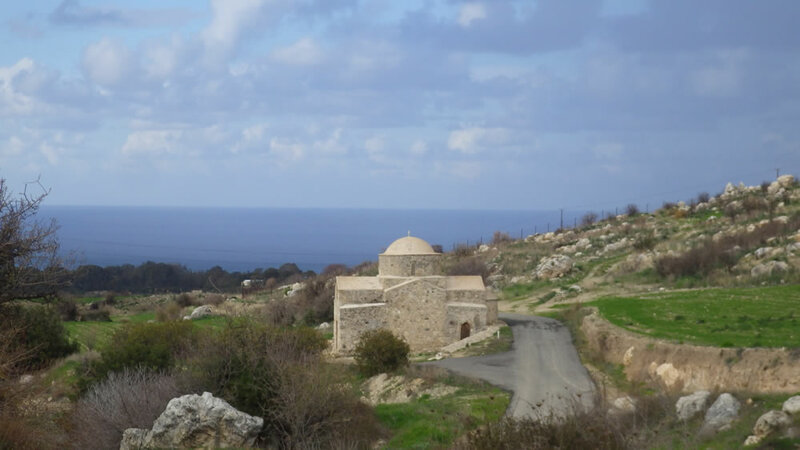 The route starts at picturesque Pera Orinis village, just 20 km southwest of Nicosia. It traverses some of the most beautiful scenery on the island mostly on narrow paved roads across Troodos mountain range to beautiful Akamas. The route is easy yet offers possibilities of additions for those preferring longer cycling experiences. The trip is great throughout much of the year (we would generally recommend September to June as it may be more comfortable for many of us for a cycling trip in Cyprus - however, with proper management, ie. cycling early in the morning and late in the afternoon, the trip can be excellent also in summer). This is a week-long trip, with a free last day in beautiful Akamas for relaxation, walking, swimming and/or exploring on a mountain bike. A free, last day in Akamas, a stunning area of Cyprus, with the possibility for relaxation and swimming or further exploration on foot, by bicycle or in the sea. Relatively easy short distances per day, with the possibility to add extra miles for those preferring longer cycling each day. On Day 1 from Larnaca airport or Paphos airport travelers are transported (with their rented cycling equipment) to the old part of Pera village. 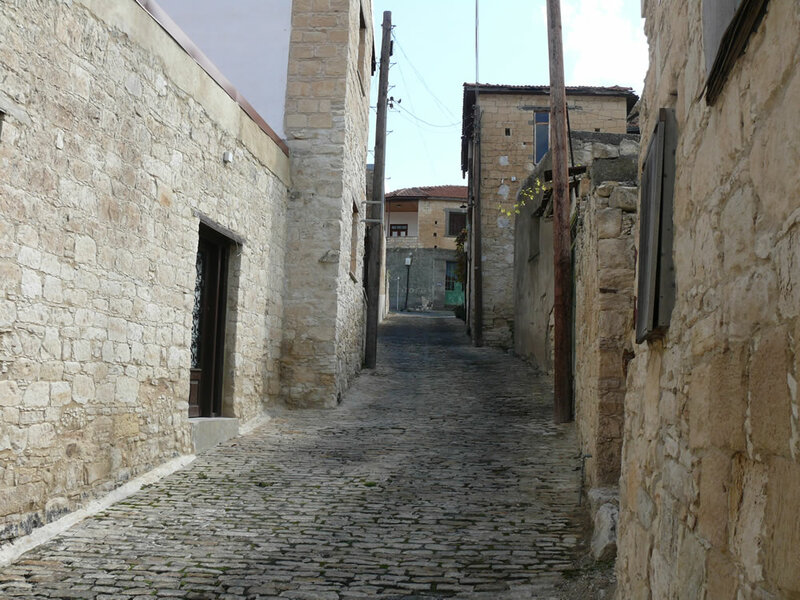 Depending on the time of arrival they could relax and explore the old part of the village and/or visit attractions in the area (eg old watermills, Agios Iraklidios monastery, the ruins of Tamassos ancient city-kingdom or even visit the surreal divided walled city of Nicosia. On Day 2 travellers ascend to Palaichori, one of the larger villages in Troodos. On the way they pass by very picturesque tiny Fikardou village and small Apliki dam. In Palaichori village one can visit the church of the Transfiguration of the Saviour, one of the ten Unesco World Heritage Troodos Painted churches. 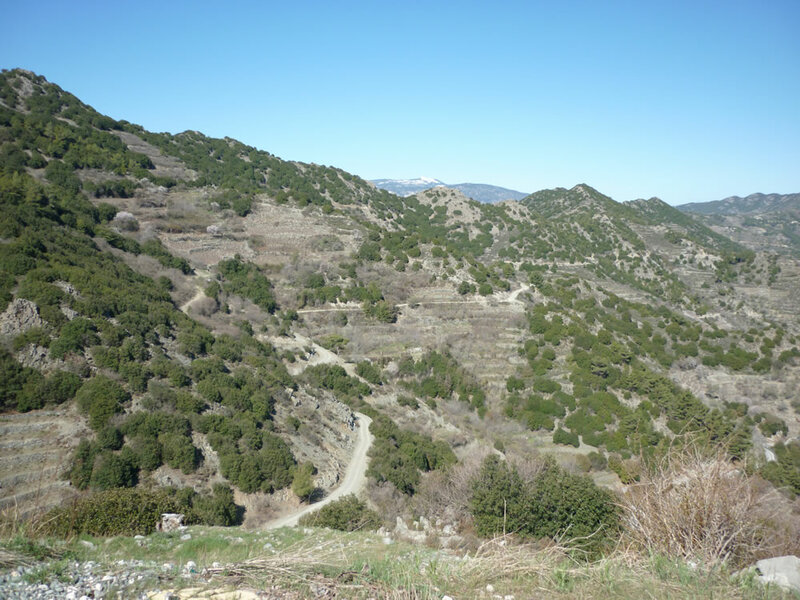 On Day 4 the explorers cross to the south side of Troodos mountains. First they pass by Agios Nikolaos tis Stegis Unesco World Heritage Troodos painted church towards Pedoulas village (home to yet another Unesco World Heritage Troodos painted church) and then cross the ridge to the south. 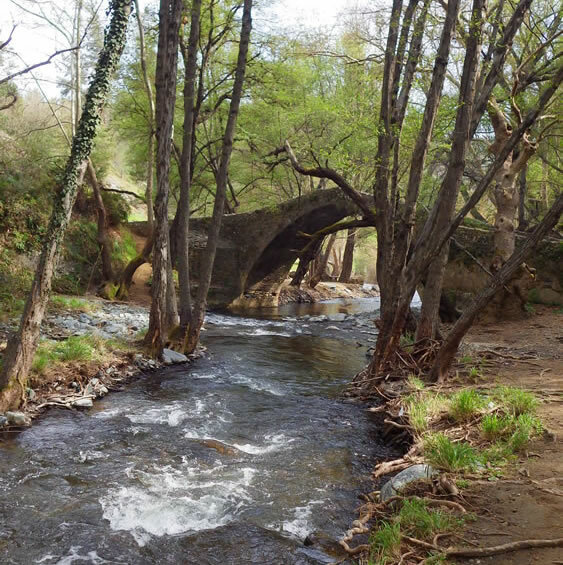 The route takes them close to Chantara waterfalls and close to Milia medieval bridge and through touristy Omodos village before ending at stone-built Arsos village. On Day 6 of the route the explorers cycle through yet more stone built villages (eg Phyti, Filousa). They traverse Evretou valley before descending through Polis to their final destination, at the entrance of beautiful Akamas peninsula. On the way they pass very close (200 m) from Skarfos medieval bridge and Evretou abandoned village and the crescent-like manmade lake of the same name. ​On Day 3 travellers cycle along a scenic route in the Pitsilia region offering excellent vistas from the north side of Troodos mountains, towards Mesaoria plain, Morphou bay and even Pentadactylos mountain range. The route passes through a collection of orchards and forest stretches and through a number of pretty mountain villages and by Unesco World Heritage Panagia tou Araka church. It finishes in the well preserved stone-built old part of Kakopetria village. Panagia tis Podithou Unesco World Heritage Troodos painted church north of Galata village is just a couple of km away. Day 7 is a free last day of this excellent trip. The travellers have the opportunity to relax and enjoy beautiful Akamas. Options include swimming, exploring on foot, mountain biking or even exploring the coastal waters of what is considered by many as the most stunning corner of beautiful Cyprus. Extensive information on our inhouse designed route that presents much of the best Cyprus has to offer, combining top elements of its cultural and natural heritage. We provide information on each day's walk and instructions to find one's way, as well as relevant useful information material on Cyprus (including GPS readings and Phivos Ioannides book 'Exploring Authentic Cyprus'). Arranging rental of biking equipment and providing relevant support. Booking of breakfast. Because there are a number of dining options very near to travelers accommodation, dinner is not booked. Upon request we can include dinner(s) in the package. Arranging all applicable biking equipment transport. Arranging transfers to location on arrival. On the ground support for the independent explorer. a) Information on the cycling routes and nearby attractions, in the form of GPS readings, printed material and/or other media. from Larnaca airport or Paphos airport (or similar) to the first hotel in Pera Orinis village. Note : The package doesnot include transport from the (last) hotel near Akamas to an airport. We believe that the relevant bus connections are good and therefore encourage the travellers to use public buses. a) two cyclists (sharing a Burley Nomad cargo trailer) travel together on a Double Occupancy, bed and breakfast basis is 699 Euro per person. b) two cyclists travel together in separate rooms, bed and breakfast basis is 870 Euro per person. c) a single traveller on bed and breakfast basis is 1,050 Euro per person. The cargo trailer (described above) must be returned at the end of Day 6 at the accommodation near Akamas. a) two cyclists travel together on a Double Occupancy, bed and breakfast basis is 820 Euro per person. b) two cyclists travel together in separate rooms, bed and breakfast basis is 960 Euro per person. c) a single traveller on bed and breakfast basis is 1,200 Euro per person. If there is availability for all places then we notify the Customers and we proceed to step 3. Otherwise, if some of the properties are unavailable we notify the Customers and provide them with alternatives. Then we proceed to step 3b. We expect that all users of our services will make all necessary arrangements to, and will for the duration of their trip with us, be covered by adequate insurance related to our services (personal accident, medical expenses, bicycle theft, etc). ​​Please keep in mind that cyclists may buy services from us for a shorter version of the trip (eg, a 4-day route instead of the weeklong cycling route) or they may extend their trip staying at any of the accommodation options on our route for more than one day.